All 3 of these players all suffered injuries that cost them the season. I will break down how each PG was injured and how it affected their teams title chances. In 2011-12, Derrick Rose was coming off a fantastic season from 2010-11. He had just became the youngest player in history to win the MVP award at just 22 years of age, quite a remarkable feat, averaging 25.0 points, 7.7 assists, 4.1 rebounds on a 0.445 FG% on a career high 3pt% of 0.332. Coming into the 2011-12 season everybody was expecting another great season from the then reigning MVP, and he didn't disappoint; averaging 21.0 points, 7.9 assists and 3.8 rebounds. But during Game 1 of the first round of the 2012 playoffs against the Philadelphia 76ers, Rose injured his left knee while trying to jump, the crowd fell silent and all knew that something was immediately wrong. The injury occurred when the Bulls were leading by 12 points with 1:22 left to play. 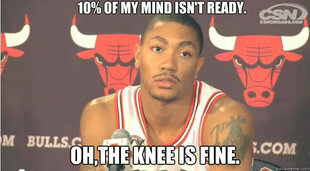 An MRI later revealed that Rose tore the ACL in his left knee and would miss the rest of the season. 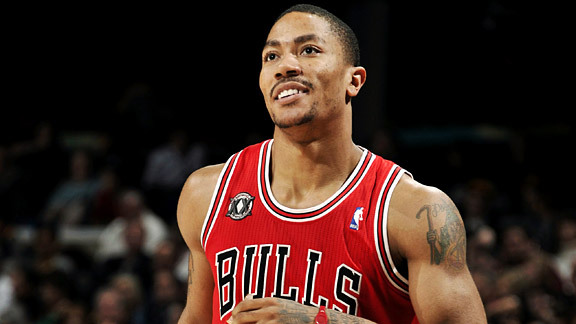 Rose had surgery performed on May 12, 2012, with an estimated recovery period of 8–12 months. The guard from the University of Memphis then underwent a grueling and lengthy rehabilatation process. 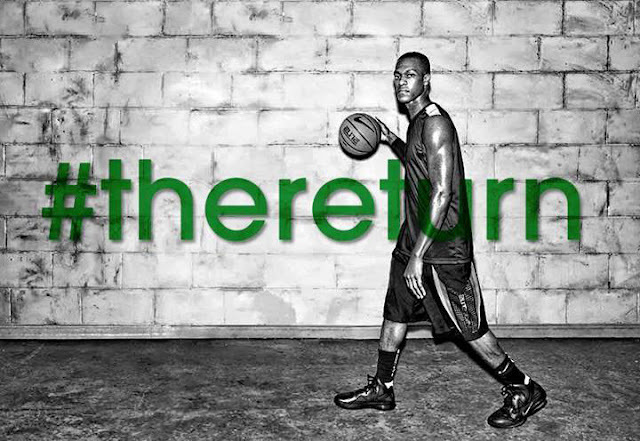 There were promos from Adidas such as #TheReturn. When this past season came around, people expect D-Rose to comeback around the All-Star break, give or take a few weeks. But this wasn't the case. Rose didn't rush back, but the clock was ticking. The playoffs were nearing and more and more speculation in the barracks of social media of when he would return, but still D-Rose said he isn't coming back until "110%" and "mentally ready". This went on and on and on for weeks and the speculation began to turn into slander toward the PG. Derrick Rose sat on the bench, suited up, during the Bulls' playoff run. The Bulls struggled along the way, first pushing a weaker Brooklyn squad to 7 games and then falling to the HEAT in 5. It was evident that Chicago were missing their star player, their playmaker, their MVP. Luol Deng among other Bulls suffered injuries and were ill due to an increase in minutes, and many were to blame D-Rose for not playing, saying that their team-mates are throwing up out there and he is not willing to help. Eventually, when the Bulls were knocked out, it was evident that Derrick took the right decision and now he is on the road to recovery and an even healthier knee next season, but Chicago struggled mightily without him and this is why he was so important. This was also evident last season when the Chicago Bulls #1 seed with a dominant 0.758 winning% fell to the 8th seed Philadelphia, this happened due to the absence of Derrick Rose after Game 1. Meanwhile all attention turns toward whether Derrick will be ready for the start of next season, or will he wait till he's "110%"? We will see. 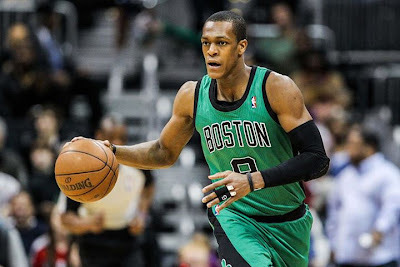 Rajon Rondo, Celtics Star player, and who many the best PG in the NBA. Well, his resume doesn't lie. 1x NBA Champion, 4x All-Star, one-time All-NBA team selection and a four-time All-Defensive member. 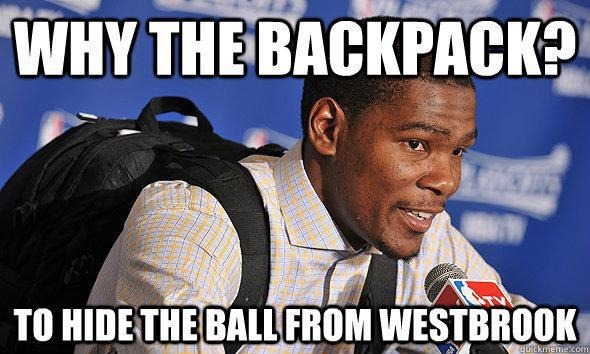 He also led the NBA in steals during the 2009–10 season and assists during the 2011–12 and 2012–13 seasons. 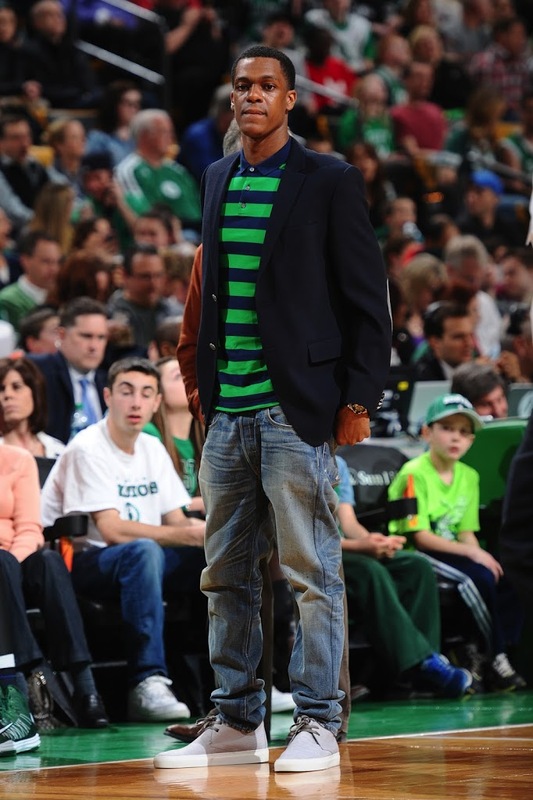 He ranks sixth in Celtics history in assists and third in steals. Fresh off the EC Finals where he was absolutely dominant, getting triple-doubles and dropping 44 points in Game 2, many were ready for his future of the leader of the veteran Celtics - who added a huge ton of young talent in Jeff Green and Courtney Lee - and see how he can lead the Celtics into the future. The Celtics had a rocky start but nevertheless Rajon Rondo was playing outstanding going into January, where he was selected as a starter for the East in the All-Star game, alongside fellow Celtic Kevin Garnett and rivals Dwyane Wade & LeBron James. Rondo looked primed and ready to help the Celtics turn their mediocre record around and push for Banner 18. But on Sunday, January 27, we learned, during a epic match-up between the Celtics and Miami at the TD Garden, that Rajon Rondo would not play and was getting an MRI for an injury occuring on Friday, January 25 against the Hawks in Atlanta. 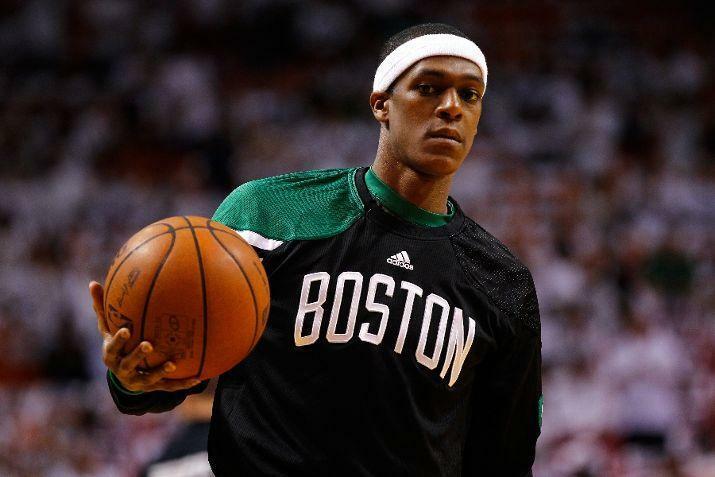 News later broke throughout social media and on the ABC broadcast that Rajon Rondo had indeed tore his ACL and would miss the rest of the season. This was a huge blow to the Celtics. Not just huge, but ENORMOUS. The Celtics now had to move forward without their leader and their star. Boston came out after half-time swinging, and in a match-for-the-ages the Celtics defeated the HEAT in a 2OT thriller. The Celtics then went on a roll, their best stretch of the season, winning 7 in a row. Many were speculating saying if Rajon Rondo was as valuable as they thought, and whether or not he is that important. Some even went to the extremes of saying he should be traded - But how wrong they were. Yes, the Celtics did win 7 straight, but this was off pure adrenaline and in memory of Rondo, but soon the PG issue began to catch up to them. 6'1" Avery Bradley, a natural SG and gifted lockdown defender, was forced to take over the PG role. 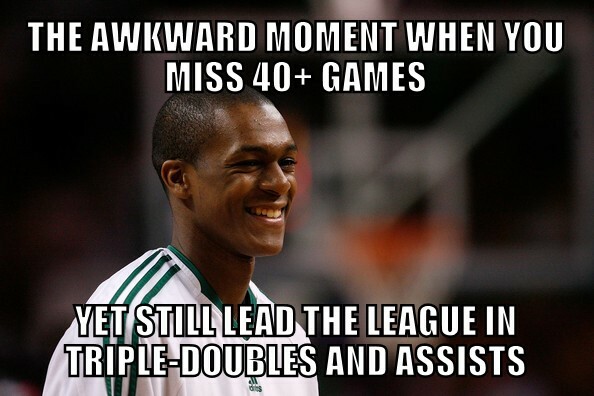 He tried as best as he could, however he was no Rajon Rondo. The turnovers became a glaring problem and Avery's ball-handling wasn't that great. Courtney Lee, Jason Terry among others also tried to cover the PG role, but none succeeded. This was clearly evident in the playoffs, in the 1st round, where Boston were matched up against the Knicks. Avery Bradley was a turnover machine and was completely shutdown by the likes of Felton and Shumpert. This also caused Avery to lack on his star quality - defense. As he had to always contribute to the offense. Eventually, the Celtics crumbled after and inspiring run to close their season. The reason for the loss was not the Knicks execution, but the fact that the Celtics didn't have their floor general Rondo and his ability to control the tempo and completely take-over a game at will. The Celtics will get their all-star back come next season, due to his injury his athleticsm might not be there as much, but the way he plays in his passing game will keep him in this league for a long time, where he will continue to break records and make history. The injury didn't come with a few benefits such as the emergence of Jeff Green. It also gave Rondo the chance to see how the team works, so then when he gets back to them, he'll know exactly how to achieve the best out of the team. Although the Celtics suffered without Rajon and have lost KG and Pierce to Brooklyn, the future is still bright for the team and the All-Star PG. Ah, the young star out of Oklahoma who many criticise for his lack of efficient thinking and bone-head decisions, actually contributes a lot towards his team. As reinforced by the Thunder's early and shocking exit. Russell Westbrook, Kevin Durant along with fellow then-teammate the new star of Houston, James Harden, were very impressive in their 2011-12 campaign, finishing 2nd in the Western Conference and falling short in the Finals. Still extremely young, they all had a lot more promise, and people began to predict multiple titles in their future. Then in the Summer of 2012, news broke out that James Harden, sixth man of the year, had been traded to Houston for K-Mart and fillers. This was it people thought, they thought that the Thunder had screwed up and that they won't be able to win the tough west without the 3rd star of their trio. Nevertheless, the Thunder proved the doubters wrong, finishing 1st in the West at a record of 60-22. Westbrook averaged 23.2 points, 7.4 assists, and a career-high 5.2 rebounds. The Thunder looked ready to make a strong playoff surge and push for the champiosnship alongside runner-up for the MVP award, back-to-back scoring champion Kevin Durant. pril 25, 2013, in the second game of the series, Westbrook injured his right knee when Rockets guard Patrick Beverley collided with him in an attempt to steal. Although Westbrook began to limp, he would continue playing, and finished the game with 29 points. However, it was revealed the next day that Westbrook had suffered a slight tear in his right meniscus. The Thunder were able to fend off the Rockets in 6, although looking shaky at times. 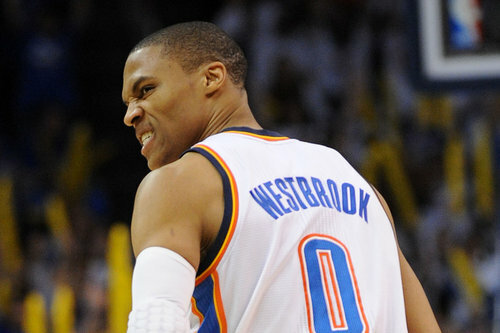 But the full impact of Westbrook's absence was felt in the next series against the tough and gritty Memphis Grizzlies. The Thunder fell in 5, and the scoring and athleticsm that Westbrook brang the team was extremely and evidently missed by the team. This ultimately led to a dissappointing playoff performance. Westbrook should be back around the end of 2013, so expect the Thunder to get straight back to work. So without PGs running the team, the teams were unable to get the job done.